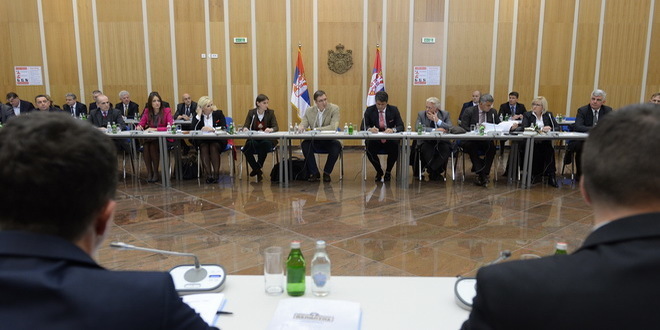 In the Officers House in Niš, on Thursday, October 13th, 2016 a working meeting was held with the Prime Minister Aleksandar Vučić and the members of the Government of the Republic of Serbia. The meeting was attended by the chiefs of Nišava, Pirot, Toplica, Jablanica and Pčinja districts, as well as by the representatives of local governments, mayors and municipal presidents. After the Prime Minister´s introductory speech the present municipal presidents and mayors individually addressed the Government representatives and the Prime Minister and presented problems in their respective regions. The joint conclusion pertained to the lack of jobs and the necessity of obtaining the Government assistance regarding the involvement of new investors. Mayors, municipal presidents, and the representatives of the Pirot District also presented specific requests and solicitations. We have been promised help regarding the road infrastructure, the completion of the current projects and introduction of foreign investors to our district, which would create opportunities for further employment. It is extremely important to emphasise that the idea of bringing the Government to the scene is a major step forward in communication and resolution of the issues which local governments could not resolve without the help from the State.